Since the conflict in Syria began, there have been numerous and horrific violations of humanitarian and human rights law, including the systematic use of chemical weapons. A New Normal: Ongoing Chemical Weapons Attacks in Syria is a report by the Syrian American Medical Society that documents 161 chemical attacks from the beginning of the conflict through 2015, using reports and first-hand accounts from physicians and health workers in Syria. SAMS compiled another 133 reported chemical attacks that could not be fully substantiated. The 161 documented chemical attacks have led to at least 1,491 deaths and 14,581 injuries from chemical exposure. Out of the 161 attacks, 77% have occurred after the passage of United Nations Security Council (UNSC) Resolution 2118 in September 2013, which created a framework for the destruction of Syria’s declared chemical weapons stockpiles. In 2015, there were 69 chemical weapons attacks, making it the year with the most chemical weapons attacks in Syria to date. 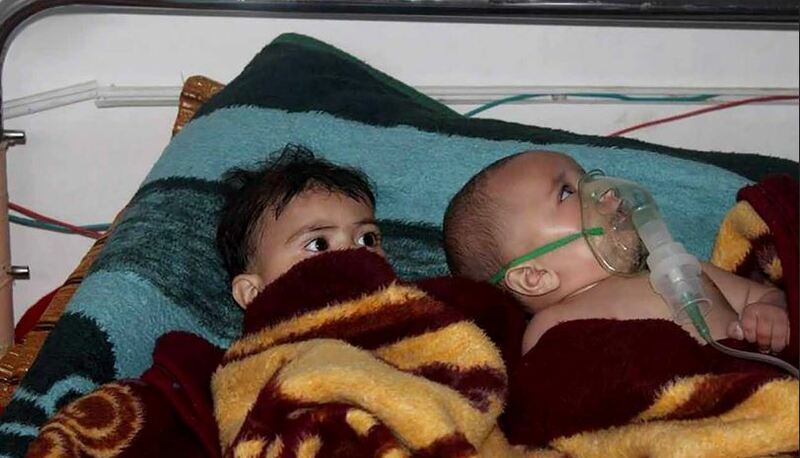 At least 58 chlorine attacks, or 36% of the total chemical weapons attacks, occurred after UNSC Resolution 2209 which condemns chlorine gas as a weapon in Syria. Chemical weapons were used in Syria as early as December 2012, when civilians in Homs were treated for symptoms of chemical exposure. The use of chemical weapons escalated beginning in March 2013, particularly in Rural Damascus, Aleppo, and Homs. On August 21, 2013, rockets filled with sarin were launched into Rural Damascus in the largest chemical attack in Syria to date – more than 1,300 people lost their lives in this horrific attack and over 10,000 more were affected. This massacre was a turning point in the conflict in Syria, shifting the course of chemical weapons use. In the fall of 2013, Syria acceded to the Chemical Weapons Convention and began dismantling its declared chemical weapons stockpile under the process established by UNSC Resolution 2118. The use of nerve agents all but ceased, but was replaced with the widespread use of chlorine gas. Barrel bombs filled with chlorine gas were used systematically in civilian areas of opposition-held territories beginning in 2014, particularly in Hama and Idlib. By the summer of 2015, the types of chemical agents being used and number of actors using chemical weapons increased, as non-state actors including ISIL were accused of using mustard gas and chlorine gas. The use of chemical weapons in Syria has continued into 2016. The chemical preparedness and response efforts in Syria have been almost entirely Syrian and Syrian NGO led. Since early 2013, Syrian NGOs took the lead in creating public awareness campaigns around chemical attacks and developing locally salient training programs for health workers and first responders. These trainings address general preparedness operations, health problems following exposure to chemical agents, personal protection equipment, decontamination procedures, medical management, criminal documentation, and more. Syrian NGOs have also taken a leading role in collecting and transferring samples for the international documentation process. The psychological impact of chemical attacks on individuals and communities is particularly dire. Exposure victims and medical personnel often suffer from post-traumatic stress disorder, flashbacks, and depression, compounded by other daily horrors of life in a conflict zone. Chemical attacks have caused civilians to flee their homes and communities. Medical workers are placed in a particularly challenging situation, having the burden of deciding who will live and who will die. The rate of chemical attacks increased after UNSC Resolution 2118, through the use of chlorine-filled barrel bombs being dropped primarily over civilian areas and residential neighborhoods. The use of chemical weapons is part of a strategy of displacing Syrians in opposition-held territories. The lack of enforcement of international humanitarian and human rights law and several UNSC resolutions spurs the continued use of chemical weapons. Local and Syrian NGOs overwhelmingly led the chemical preparedness and response efforts inside of Syria, from developing a locally salient response training to creating a documentation protocol. Read A New Normal: Ongoing Chemical Weapons Attacks in Syria.